Rosemary (Rosmarinus officinalis) is an evergreen tree with pine needle-like leaves and bluish-gray flowers that bloom in the spring. This decorative tree grows from three to five-feet tall and it's leaves are harvested year round providing both medicinal and culinary uses. The aromatic herb can be steeped as a tea to provide relief for stomach upsets, infused in oils to rub on sore muscles or used in cooking for dishes such as lamb and chicken. Caring for rosemary is relatively easy. Use a clay pot to grow your rosemary in that is large enough to accommodate the growth of the tree so it does not have to be re-potted often which can cause stress to the plant. Use a well-draining soil to grow the tree in. Set your pot in a location where it will receive full sun for at least four hours daily and some afternoon shade. If growing inside place in front of a south-facing window for the best light. Water your tree consistently every other day or so to keep the soil moist but not soggy. Allowing the top one-inch of soil to dry out before watering helps to ensure that the tree does not receive too much or too little water. If the tree is being overwatered, the tips of the leaves will turn brown. Mist the plant a couple times weekly to provide adequate humidity. Also setting the pot on a pebble-lined tray filled halfway with water will keep the humidity level high enough. 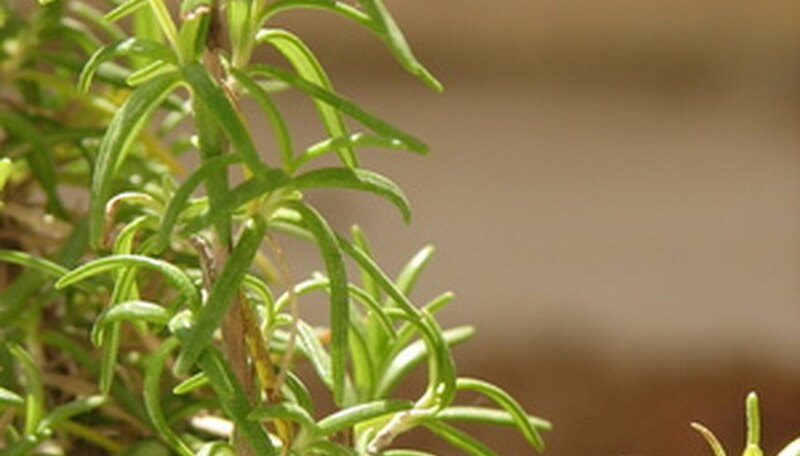 Feed your rosemary tree with a slow-release granular in early spring before the flowers grow. During the active growing season from late spring through summer, use a liquid seaweed fertilizer once a month. Add crushed stones, pea gravel or small rocks to the pot. This helps the soil retain moisture and keeps the soil temperature consistently warm. Prune your tree to keep shaped. Cut the tips of the leaves during early spring before the flowers begin forming and cut back the top of the tree if it is becoming too tall. Do not over water the rosemary tree. Avoid pruning during the flowering stage in late spring. Do not set the pot in water.